The Black Eyed Peas are back in effect and announcing they will be embarking on a tour throughout Europe as a unit for the first time in 8 years starting on October 27th in London and capping off on November 18th in Dusseldorf, Germany. Tickets go on sale on 13 July at 9am at LiveNation.co.uk. Today the group has also premiered an explosive new single and provocative video titled “Get It” to celebrate the news and bring light to urgent social issues. The video encourages awareness and action on Police Brutality and Immigration reform. “Get It” comes on the heels of two previously released politically charged singles and visuals for “Street Livin'” and The “RING THE ALARM pt.1, pt.2, pt.3.” Don’t miss the Peas live on tour this Fall and stay tuned for more new music from will.i.am, Taboo, and apl.de.ap coming soon. 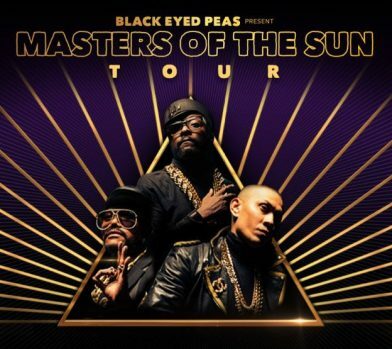 The ‘Don’t Phunk with My Heart’ hit makers consisting of rappers apl.de.ap, Taboo and ITV’s The Voice regular and lead vocalist will.i.am will return to the spotlight for with their Masters of the Sun tour. With 7 chart-topping studio albums, 25 million YouTube views and over 10 million monthly Spotify listeners, the GRAMMY award-winning hip-hop group and pop sirens will perform their catalogue of eclectic hits. For over two decades, the band that blessed us with the iconic tracks that filled radio waves and broke records, The Black Eyed Peas are back. 2018 marks the 20th anniversary of the formation of the original line up of the group, proving still that their music continues to stand the test of time as the world eagerly wait for more new music.